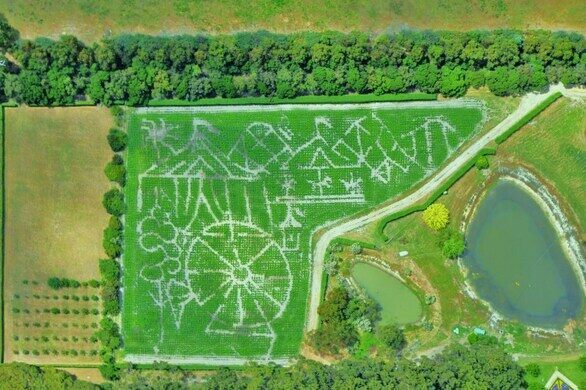 Largest maize maze in the Southern hemisphere built with GPS technology on more than two acres. 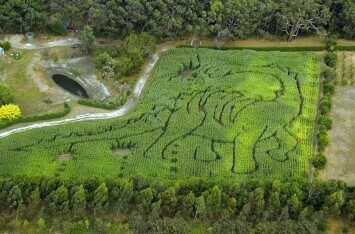 Mazes of maize have been built all over the world for hundreds of years, but this is not just any maize maze. 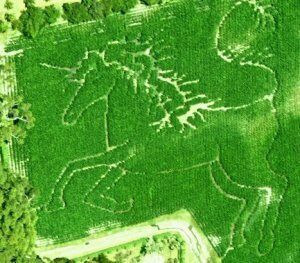 Every year, the Enchanted Maze Garden at Arthurs Seat plants over 100,000 stalks of corn to create the Maize maze, which changes in design from one year to the next. It’s the most popular attraction at the Enchanted Maze Garden, which operates several other mazes year-round. Australian museum dedicated to human health and lack thereof. The Maize Maze, when completed, is the largest of its kind in the Southern hemisphere and takes up more than two and a half acres. It is created using GPS technology so that the final shapes, while only visible from the air, make up an elaborate design. The Maze is open from mid-February through late April. For those who can’t visit in that short timeframe, the Enchanted Maze Garden also maintains other mazes throughout the year: a traditional hedge maze with a Japanese Garden at its center, an ancient turf labyrinth, and a circular roomed maze for children. In addition, visitors enjoy the Blue Gum Gallery Maze, which allows participants to see the center from a bridge and proves that being able to see the entire maze doesn’t make it much easier to navigate. The Sculpture Park Walk is five acres of old growth eucalyptus filled with pieces made by a rotating artist in residence. Other features of the Enchanted Maze Garden include maintained topiaries, such as a Santa sleigh complete with reindeer, cacti gardens featuring ceramic creations, and a vegetable garden. The Amazing Lolly Shop provides a welcome respite from all of the mazes and topiary. A miniature train that runs along the ceiling can distract kids from the jars full of sweets that fill the shop. For better or worse, this whimsical sculpture garden was a favorite place of Rupert Murdoch's. Australia's only intact colonial warship never saw action before being turned into a scenic wreck. The twists and turns of this serpentine maze are over 170 years old.